India is a land of bewildering diversity. People of diverse faiths and religions bind together in a great melting pot to form one colorful mosaic. The Indian calendar is a long procession of festivals: a festival for every reason and for every season. The colorful fairs and festivals of India owe their allegiance to religious or historical events or to the change of seasons. Every celebration centers around the rituals of prayers, seeking blessings, exchanging goodwill, decorating houses, wearing new clothes, music, dance and feasting. They reflect the vigor of the lifestyle of its people. Vibrant colors, music and festivities make the country come alive throughout the year. In the traditional culture of India, dance and music envelops the entire life of man in a shell of melodic sound. Dance and songs celebrate the seasonal rhythms in nature and the songs of the plough man and boatman, shepherd and camel driver, add harmony to the pulse of work. This folk tradition has been one great source of India's culture, which is rich in spontaneity. The folk music and dances of India represent the melody, aesthetic values, and rustic ethos of the nation. The conduct of folk dances and music on occasions of temple festivals and community functions gives entertainment, myth and merry to villagers. The primary impulse of Indian folk dance is rhythm - a spontaneous expression of joy in times of deliberation. From the simple beat of the drum to the complex rhythm of a cultivated art, it is the love of rhythm that creates the dance. The folk dances and songs of the peasants, hill folk and aboriginal tribal peoples bring happiness and recreation to their simple communal life. Folk dances and plays that have their roots in religious and seasonal festivals have a cultural background and are a vital part of India's artistic heritage. Sanskrit literature of medieval India describes several forms of group dances: Charchari, Hallisaka, Talai-Rasaka, and Danda-Rasaka. Charchari was a dance in which girls entered in pairs and formed groups, dancing with sticks to mark the rhythm of the accompanying music. 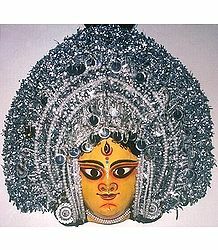 Charchari was danced in spring in the honor of kings. 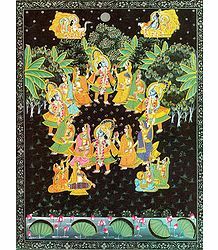 The Brijvasis of Brindavan (childhood residence of Lord Krishna) performed the Charchari dance at temples and elsewhere during the Spring festival of Holi. Hallisaka was a herdsman's dance performed on special occasions such as the coronation of kings. It was a circular dance of women led by one man, a dance in which both genders participated, the men and women being alternately arranged. Another version says Hallisaka is the dance of the Gopi's (consorts of Lord Krishna) with Lord Krishna as a leader. It is known as Rasak or Ras. Ras also means a circle. 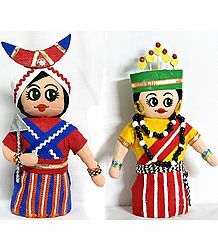 There are two kinds of Rasak or Ras dance. 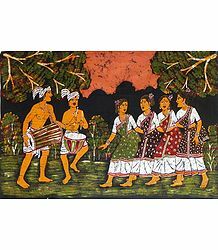 Talai-Rasak, with rhythmic clappings of hands and Danda-Rasak in which each dancer marks the rhythm with a pair of sticks (danda). The Natya Shastra defines group dances of women as a prelude to a drama. 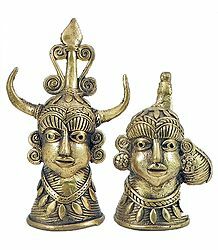 They are in four forms: Pindibandha (a group), Shrinkhala (chain form), Lata (creeper form of interwining) and Bhediyaka (the separate movement of each dancer away from the group). Dance has been an essential part of folk culture. It is a spontaneous expression of joy in times of celebration. Folk dances are the rural extensions of the larger Indian population. Some of the popular folk dances of India are Garba, Bhangra, Bihu and Yaksha Gana. 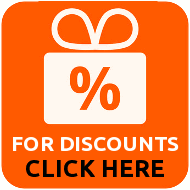 India can boast of a vast tribal population belonging to diverse races and culture. The majority of this population inhabits the forests and hilly regions. Each of these tribes is marked for its own culture, different from others. It not only varies in their socio-economical life but also in religious ceremonies. Tribals are the original forest dwellers and are found in every regions of India. Tribes of the northern part of India, stretched over Himalayas, practice from nomadic shepharding to primitive cultivation, Mongolian tribes of the North-east, the tribes from the dense forests of Baster and Chotanagpur and the tribes from South India, have a common dance form on the activities of hunting, fishing, food gathering and animal husbandry. In the dances of plains and the thickly wooded plateau, one can see the exuberance and the gaity of the tribal way of life. The Gonds and Marias of Bastar, Oraons and Santhals of Chotanagpur all have a rich heritage of community dancing. The most important aspect of tribal culture are music and dance. Among certain tribes young men cannot find brides unless they acquire special skills in dance and music. 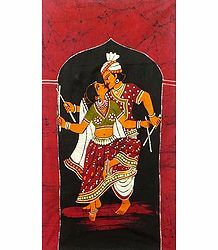 Dance and music are primarily meant to propitiate Gods and Goddesses. In social functions like marriage and feasting, dance is performed in a central place of the village or in the communal house and attended by almost all the tribesmen. Each tribe has its own pattern of dance and music. Some of the popular tribal dances of India are Santhali, Gaur and Lava. Tribal and folk dances today provide the thread of continuity between the distant past and the present.